A recent analysis of the artificial intelligence (AI) market in the United States education sector predicts a compound annual growth rate of 47.5 percent throughout the 2017-2021 forecast period. An early adopter, California State University East Bay is harnessing the power of AI to offer online students a new learning and assessment experience. Starting this summer, CSU East Bay students will use AI-powered tools from Cognii, including its Virtual Learning Assistant. 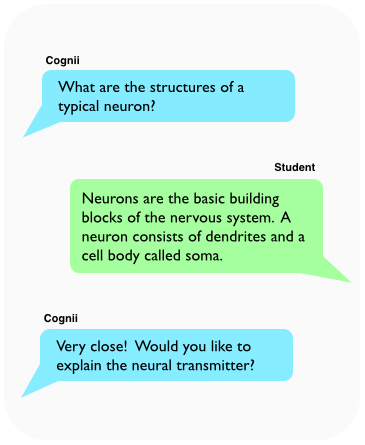 The chatbot essentially acts as a “Siri for education,” according to the Cognii website. It uses natural language processing technology to provide instant assessment of open-response answers, as well as qualitative feedback. Online learning specialists at CSU East Bay’s Office of the Online Campus and Cognii are developing interactive questions and tutorials, which will be used for the university's online transfer orientation course. "I believe there are some positive implications of using artificial intelligence for online learning — specifically for the drill and practice, large enrollment classes or specific subjects,” said Roger Wan, senior director of Online Campus, in a news release. To learn more about the Virtual Learning Assistant, watch the video below or visit the Cognii site.